The Agency - Welcome to the next EVE Online live event! 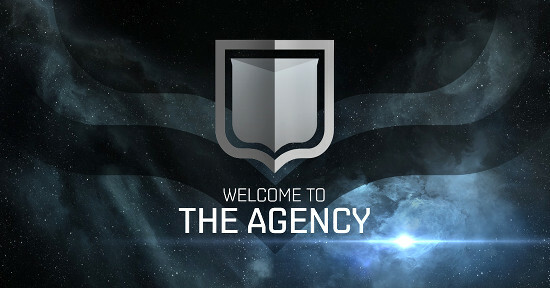 Welcome to The Agency, the new live event for EVE Online! Potential rewards: PLEX, Booster, SKINs ... and fun! The Agency offers you new challenges of varying difficulties in the world of New Eden. While none of these challenges are mandatory, they are quick to complete, they offer you an opportunity to spice things up a bit and try something different. Currently available challenges and your status are visible on the login screen and in game. 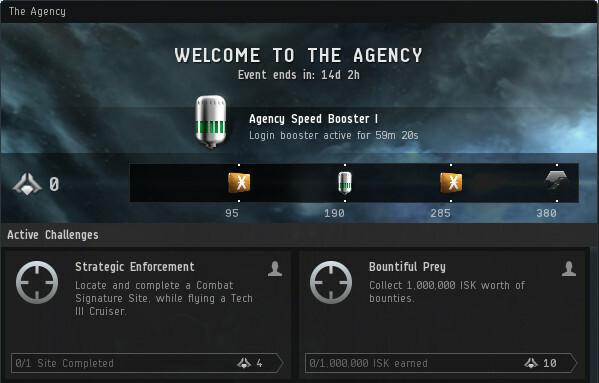 When in game, simply click on The Agency icon in the NeoCom menu. The offered challenges cover a wide range. You'll see relatively easy and general tasks (such as fighting the pirate menace by destroying a certain amount of pirate NPCs), and more specialized tasks (for example completing a combat signature in a Tech-3 cruiser), there is something for everyone! You do not need to actively accept the various challenges, just go ahead and have fun! Whenever you complete a challenge, you'll receive a notification. You can also check your progress in the The Agency overview. Completing a challenge yields points. The Agency will reward you with PLEX, boosters and SKINs as soon as you have earned enough points. The rewards will be delivered to your redeeming system. Your progress and points are easily visible in The Agency interface. Please note that you will receive a 30-minute booster after logging in. This bonus is available for everyone, but only once every 23 hours. We wish you happy hunting. Have fun!